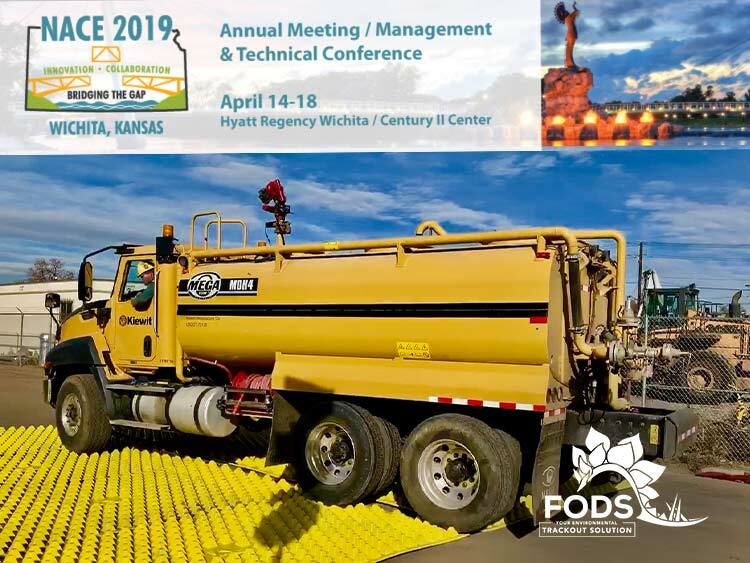 Join FODS at NACE and learn about the latest in reusable trackout technology. FODS Trackout Control Mats cut costs and streamlines operations. NACE offers 4 days of Innovation, Education, and Technical & Management Presentions with over 100 exhibitors. County Engineers, Road Supervisors, Administrators Public Works, Transportation Directors Highway Commissioners, Superintendents and Operations & Maintenance Professionals will be in attendance. FODS Trackout Control Mats create an instant temporary or permanent entrance over any type of substrate, making it an ideal solution for heavy equipment access roads and entrances. Mats are lightweight, easily interconnected and can be rapidly installed and configured to any entrance grid layout. Mats are Reusable and are easy to move, remove, and relocate. The tapered design of the pyramids on FODS Mats effectively deform the tires of heavy equipment and passenger vehicles to remove mud, rocks, and other site debris, keeping the road clean. The pyramids separate tire lugs as a vehicle passes over, causing mud to fall out and into the base of the mat. Mud will not be tracked out by subsequent vehicles. The proprietary design of the pyramids effectively prevents trackout and erosion without damaging the tire or the ground’s surface. The placement of the pyramids also allow mats to be inverted and nested together for easy stacking, storage, and transport. No excavation or disturbance of existing soil is necessary, protecting the environment. No re-sodding is needed. FODS mats have a ten year plus lifespan, are chemically resistant to acids, oils, fuels, fluids, etc., and will not transfer chemicals from one site to the next. Mats are easy to clean and require minimal maintenance and do not need to be replaced. For more information, stop by our booth or send us an email at info@getfods.com or call us at 844-200-3637.